Fight against crime and corruption. 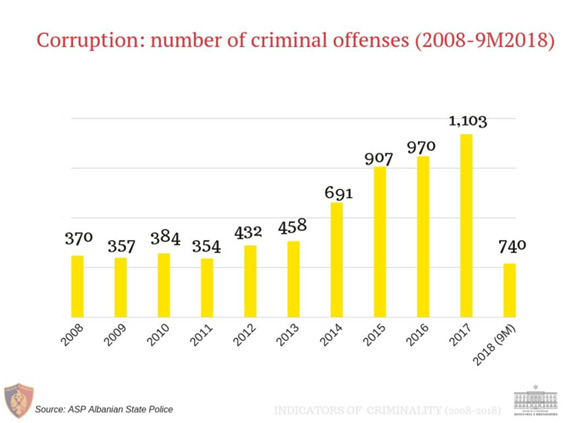 Periodic Update on Albania’s Track Record in the Fight Against Organised Crime and Corruption. The following data aim to inform the EU member states and the EU institutions on Albania’s continued and sustained results towards a consolidated track record in the fight against organized crime and corruption. These data, to be followed by regular periodic updates in addition to the regular reporting to the European Commission, provide Albania’s partners with up-to date information covering the period until 30 September 2018. From the beginning of its operation (November 2017 up to 22 September 2018), the “Power of law” Task-Force has finalized 19 operations, arrested about 132 persons, proceeded 7, declared wanted by the Police 4 persons, and sequestrated more than 16 million euros worth of their criminal assets. Cooperation (EUROPOL). Cooperation on exchanging information with Denmark, France, Spain (for 200 citizens) and other European Union countries, is ongoing. 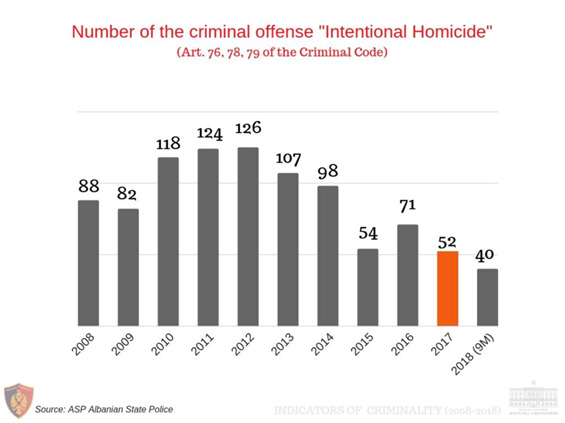  The number of intentional homicides continued to decrease from 2014, until 2017 marked the lowest record with only 52 homicides.  Up to 30 September 2018, there has been 40 intentional homicides identified – of which 32 (or 80%) solved. 2 cold cases were solved too. In total 44 perpetrators were involved –of whom 18 arrested, 16 detained, 7 declared wanted, and for 3 of them different procedures were carried.  Comparing the results for the same 9-month period January-September 2017 (41 intentional homicides), there are actually 2.5% less intentional homicides, and an increase of the detection power by 2.4%. Albania has been removed from the map of the main cannabis producing countries. 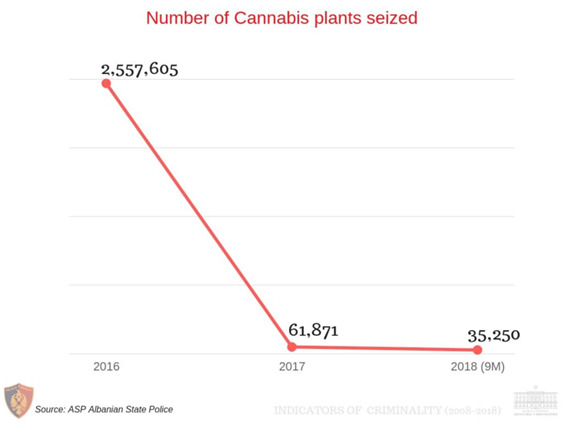 The ‘Guardia di Finanza’ flight monitoring missions and the field operations of cannabis destruction confirm that the problem of cultivation has been reduced to minimum. During this period 1766 persons were prosecuted. 35,250 for the first 9-months of 2018; 61,871 for the year 2017. 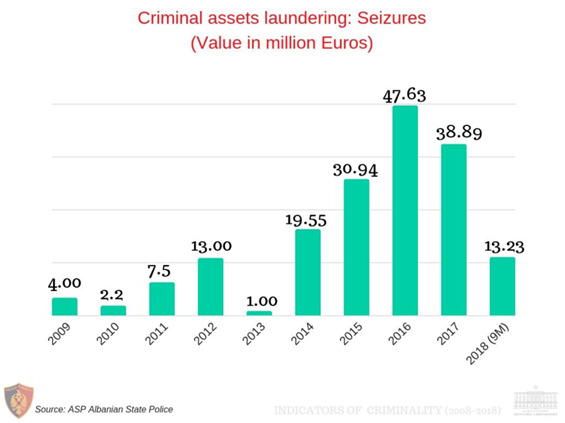 In the last 5 years, the value of seized criminal assets amounted to more than €150.2 million,with 2016 being the record year of more than €47.6 million seized. This value is 5 times higher than in 2008-2013. In the first 9 months of 2018, in regard to the Article 287 of the Criminal Code “Criminal assets laundering”, there were 285 cases referred. € 30,000 assets worth confiscated. Referrals for corruption continued to increase. Between January and September 2018, 740 criminal offences were identified for 1052 perpetrators –of whom 735 were public employees involved in 505 cases. For September 2018 only, 76 criminal offences with 107 perpetrators were identified – of whom 67 were public employees with 43 cases. In the meantime, 2% of police force have been dismissed due to the vetting process in the State Police, Guard of the Republic and the service of Internal Affairs and Complaints. 46 judges, prosecutors and legal aid removed from the judicial system, of which 25 dismissed by the Independent Qualification Committee (IQC/KPK). 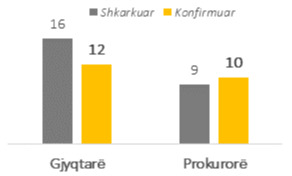 During May-October 2018, at the end of the inspections, three types of measures were recommended: (a) administrative measures aiming to increase the quality of service delivery (b) disciplinary actions in cases where infringement of legal provisions were found and (c) criminal charge was filed with the Prosecution Office for high/medium level officials. To date 262 disciplinary actions have been implemented by the respective institutions as recommended in the final report approved by ATF and criminal charges has been filed with the relevant prosecution office for 36 employees/officials of high/medium level officials.